So, you think you want to ride a motorcycle? If you haven’t already, please read the first article in the series and the step-by-step article. Signing up for a Beginner (or Basic) Rider Course is a big step and you probably have some questions about what to expect. Below is a generic description of how many programs work. Study the website of the training course you are signing up with to learn more about specifics. Depending on the training site you signed up with, you may be told to study a Student Workbook or take an online pre-course assignment. Take the time to do this work. Being prepared will put you in the best position for success and relieve a lot of anxiety. Take notes and jot down specific questions you have. Try to get a good night’s sleep before your first day. Remember that professional training organizations follow stringent procedures to ensure your safety, so try and relax. There will likely be students who have some previous experience, but the course is designed for people who have never ridden a motorcycle before. So, again, relax. Do your homework and have fun with the process. If you have access to a motorcycle, it may be helpful to sit on it and operate the controls as you learn about them from your Student Handbook. Some people are tempted to actually ride before the course. 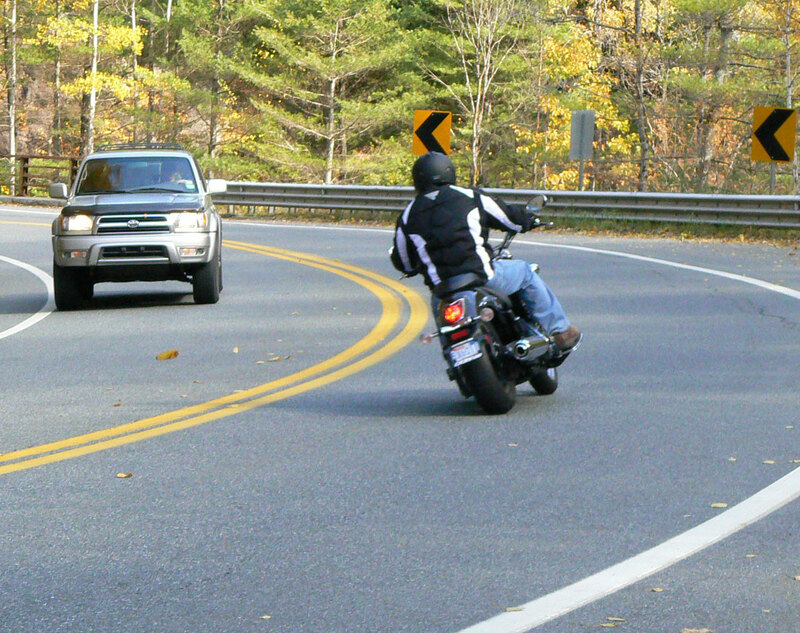 If you have your learner’s permit, you can legally ride on the road, but it’s usually best to save your first ventures on a motorcycle for the course where the instructors keep a close eye on your progress. Bring your Student Handbook and any pertinent paperwork, as well as snacks, lunch and beverages. You’ll need to wear jeans, over the ankle boots, long sleeve shirt or jacket and full-fingered gloves and a DOT-legal helmet (helmets may be available to borrow). You won’t be allowed to ride without this basic level of protection. You’ll want to wear clothing that is appropriate for the weather. Lightweight layers are your best bet so you can add or subtract layers as needed. It’s also a good idea to bring rain gear, because training is conducted rain or shine. Be sure to bring sunscreen and plenty of water so you stay hydrated. Class structure will vary widely from state to state and from course providers. Often, your first day will include classroom time and your first stint on the motorcycle learning the basics of motorcycle operation. Most courses are two days long with the second day consisting of more advanced classroom and riding time. Be sure to arrive ON TIME. There is a lot that needs to get done and stragglers muck up the schedule. You’ll likely have to sign a liability waiver and fill out some paperwork before the class begins. It’s typical for students to introduce themselves and maybe share previous riding experience. Don’t get flustered if you seem to be the only one who has never ridden. The class is designed for absolute newbies, so relax. The first classroom session will talk about risk and basic operation. Since you already did your pre-course assignment, a lot of this will be review. But, pay attention and ask questions if you need clarification. A Q&A method of teaching is often used, so be ready to participate. With the first classroom complete (and after some lunch), you’ll head out to the riding “range” to get some hands on experience. The first exercise will revisit the controls and give you a chance to mount and dismount the machine you will be riding. Next, you will get a feel for moving the bike around without the motor running, followed by learning how to start and stop the engine. With the engine running, you’ll get a feel for using the manually-operated clutch and transmission by engaging first gear and then easing the clutch out until the bike begins to move forward when you will immediately squeeze the clutch back in to avoid rolling too far forward. The subsequent exercises give you the opportunity to ride in a straight line, brake, shift gears and learn basic cornering skills.each exercise builds on the last, so that students can absorb the skills in a manageable manner. Most beginner exercises begin with a “simulated practice” where the students mount the motorcycles and go through the physical motions needed to perform the skill they are about to attempt without the motor running. 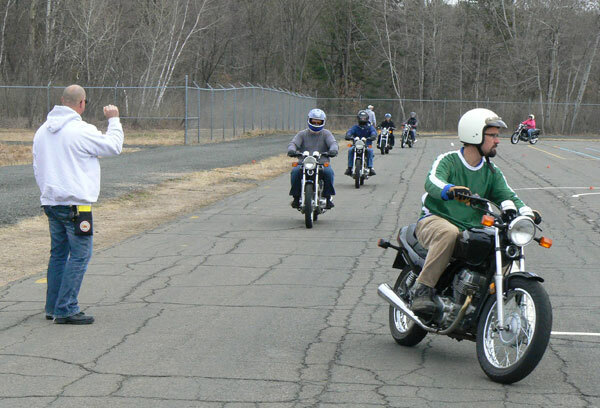 Once they get a feel for the skill, the students are set off on the motorcycle to practice. You are not yet a motorcyclist, but you can now “operate” a motorcycle. The second classroom session builds off of the first day with discussions about survival strategies, motorcycle-specific hazards and more advanced cornering, braking and crash avoidance skills. The classroom ends with a multiple choice knowledge test. Most people pass, but you must pay attention to do well. 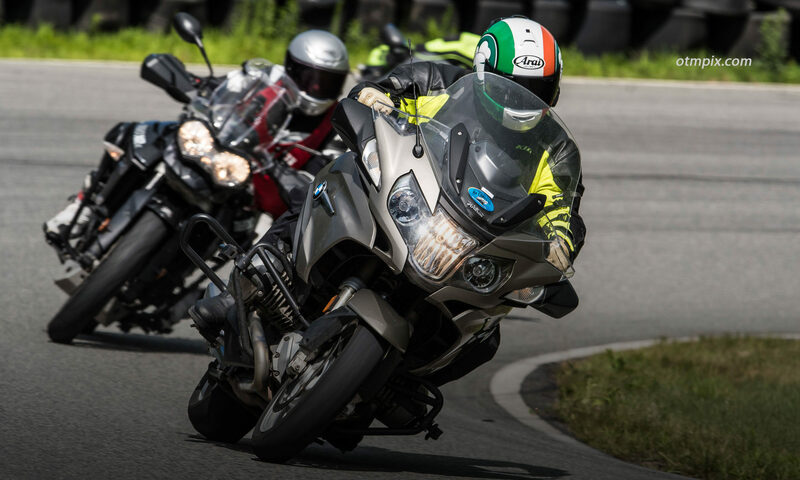 The second riding session includes practice with slow speed maneuvers, emergency braking and swerving, as well as exercises designed to increase cornering competence. At the end of the day you will be evaluated on how well you absorbed the lessons. The riding test consists of maneuvers that were taught and practiced during the day. The riding test is often the most stressful part of the whole two days. But, if you were able to successfully complete the exercises, you should be able to pass the evaluation. If you don’t pass,you will be able to retest for a fee. If that doesn’t go well, then take this as an opportunity to reevaluate whether motorcycling is a good fit for you. At the end of the course, the instructors will debrief each person and hand out completion cards. There’s a saying, “If the wheels aren’t turning, they’re not learning”, which is to say that people learn best by doing, and specifically that riders learn by practicing new skills. While it’s important that students get information necessary to perform a skill, usually through discussion and demonstration, it’s really the act of doing the skill that cements it into the student’s muscle memory and makes it truly learned. Minor tip overs are common, but thankfully full-on, higher speed crashes are relatively rare. If you tip over, don’t sweat it. If you aren’t sure why it happened, make sure to ask the instructor so you can avoid another mishap. So, you passed the course? Congrats. Now the real work begins. You can be proud of your accomplishment, but understand that you are still a novice. You learned how to operate a motorcycle in a parking lot. But, you still don’t have the skills to manage other vehicles, potholes, sand and other common hazards while also trying to think about the basics. Take plenty of time to practice, practice, practice in a parking lot on your own motorcycle before venturing out in the world. You’ll be happy you did. Didn’t pass the course? That’s discouraging, I’m sure. But remember that riding a motorcycle isn’t for everyone….although maybe it is for you. Perhaps you just need more practice before you take your skills test. The training organization may have a retest policy and/or private lessons to help folks like you to get the skills. Everyone learns differently and maybe you’re someone who doesn’t learn well at the pace of a typical group lesson. See more articles in the New Rider Zone. What were your experiences during your beginner course? Not everyone is cut out to ride a motorcycle. Welcome to the first in a series of articles specifically designed for New Riders, starting with this article that talks about considerations for would-be riders. Check out the whole list of articles in the New Rider Zone and subscribe to learn when new articles become available. Riding a motorcycle is wicked cool, but before you head down to the dealership with cash (or pen) in hand it’s important that you take a close look at what you’re getting yourself into. Motorcycling is a fun and exciting thing to do and I recommend it highly; but ONLY to those who are willing to do the work to minimize the risk! That’s one reason why motorcycles aren’t for everyone. You may be tempted to click away from this article, not wanting to hear the truth. I don’t mean to kill your “biker buzz”, but it’s super important that you get the inside scoop on certain decisions and attitudes that can negatively affect your experience. I promise not to be too much of a bummer, but I won’t hold any punches either. Why should you listen to me? Because I’m a motorcycle rider who has made motorcycling and motorcycling instruction my profession. I know what you need to know and I am happy to share it with you through these articles. The complete list of New Rider article topics can be found on the Main New Rider Zone Page. Be sure to SUBSCRIBE to the mailing list to receive notifications about when new articles are completed. This is what can happen if you’re not up to the task. You don’t need me or anyone else telling you the rather obvious fact that riding a motorcycle is risky. You’ve probably listened politely as concerned friends and loved ones attempted to discourage you from riding. They may have shared harrowing tales of people they know (or read about) who were hurt while riding a motorcycle. At least part of the answer lies in our perception that the risk is worth the reward. Is the feeling of freedom and being fully alive or savoring the satisfaction of mastering the unique challenges of riding a motorcycle really worth the risk? Motorcyclists aren’t the type to shy away from a reasonable amount of risk, but we don’t have a death wish either. Safe riding is mentally demanding. Besides the risk factor, you’ve also got to consider the high level of coordination and mental focus that is required when riding a motorcycle. You’ve got to be able to balance a motorcycle (can you balance a bicycle?) while maneuvering at slow speeds and lean into corners at fast speeds. You also need to move the machine around when it’s in your garage. Then there is the mental aspects of riding. You can’t daydream and allow distractions the way you might in a car. You also need to have eyes in the back of your head and be ever diligent about making sure other drivers see you. Not to mention the myriad of road surface hazards that most car drivers are oblivious to, because they do not have to worry about traction and stability the way a motorcyclist does. One slip up and you could be sliding on the pavement. Motorcycling is challenging. Are you up to it? There is also a convenience factor. Common sense says to always wear a helmet and protective gear, but putting this stuff on and taking it off is a pain. And then you have to stow it once you get to your destination. Are you willing to do this, even on a hot day? Before you write this whole thing off, let me tell you that it’s not all that hard to learn to operate a motorcycle. By “operate” I mean use the brakes, throttle and clutch in a parking lot. But, even basic operation takes coordination and a certain amount of strength. Advanced operation takes even more coordination. Are you up to it? Do you let your mind wander? Are you lazy about using your turn signals or do you forget to turn on your lights when visibility drops? Do you regularly drive faster than you should? Be truthful. If you answered yes then perhaps you’re not cut out for riding. But, if you’re willing to change your behavior, then perhaps there is hope for you yet. Crashing can be avoided with good risk management skills. Yes, riding is risky, however it is possible to reduce the risks to an acceptable level. But, it takes a commitment on your part. Motorcycling does not tolerate poor judgment or rookie skills. So, the first thing you must ask yourself is “Do I have the time/money/commitment to do this right?” If not, then take up golf, or some other safe activity; there is just too much at stake. If you select the right riding gear and get into a routine, dealing with this inconvenience just becomes part of the process. It means getting yourself ready earlier before work and having to put up with gawking bystanders as you walk into a grocery store carrying your helmet and riding jacket (even on a hot day). But, it’s worth it. Get creative and it becomes part of the challenge. To get an idea of where you stand and what is involved, I’ve listed the 6 stages of motorcyclist development. Each stage brings you closer to becoming a fully proficient rider who is least likely to become a statistic (provided you use good judgment, of course). This sequence of stages often goes unnoticed, but they are always present. You may be asking whether all this effort is necessary. It’s true that a lot of riders survive with mediocre skills, but they are chancing an unfortunate future by not fully developing their proficiency. Will they survive? Maybe. But, isn’t it smart to spend a bit more of your resources to minimize the risk of pain and misery? Contemplation- You’ve fantasized about riding and have become “moto-curious”. You read articles like this to see whether it’s something you want to pursue. You learn that riding is a commitment and not just a fun pastime. You can easily back out if you think it’s not for you. Preparation/Determination- You decide you want to go to the next step, which is to find out how one goes about becoming a rider. You can still back out. Action- You contact a rider training facility and schedule your beginner rider course. Backing out becomes a bit harder, but you can decide not to continue even after completing the course. Learning to Survive- You apply the lessons from the beginner course to real-world riding. This can be a precarious time because there is a big gap between parking lot training and surviving on the roads. This is stressful and can be discouraging and scary, but riding eventually becomes less stressful and more fun as you continue to learn and purposefully practice. Advanced Training- You seek additional training because you understand that there is more to riding than being able to get around without falling down. Blog articles, advanced parking lot courses, on-street training, and track days are all available to help. Riding takes on a high level of satisfaction during this stage. Skills Maintenance- You continue reading about how to reduce risks and how to ride better and find more opportunities to become the best rider you can be. Remember that you don’t know what you don’t know. This never-ending stage keeps skills sharp and involvement high. Riding is a blast, but you’ve got to be ready to learn. With these stages in mind, consider how much you’re willing to commit to this endeavor. It takes time, money and desire to do it right. Are you willing and able to commit? If the answer is no, then I suggest you move on. I may not know you, but I still don’t want you to get hurt. There’s enough of that going around already. There’s still time to back out. If this article didn’t scare you too bad and you still want to continue, click on the next article in the topic list and carry on. If, on the other hand, you don’t think you have the wherewithal to commit to going all the way, then it’s best if you walk away and save yourself and your loved ones a lot of grief. Credit must be given to the National Motorcycle Institute for the training philosophy that not all people should ride motorcycles. You can’t become a motorcycle fatality if you don’t ride a motorcycle.